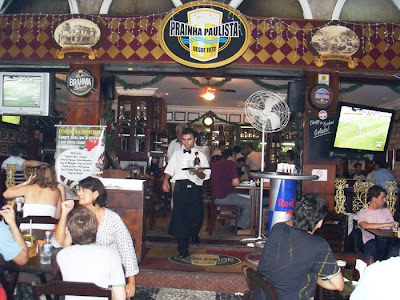 Prainha Paulista (Paulista Little Beach) is the name of a bar close to the Paulista Avenue, a perfect meeting point for happy hour. Currently frequented by business people, this bar offers tap beer, caipirinha and lots of delicious snacks. The name comes from the idea of having a little beach close to the busiest business place in town. The position of the pub, plus and arquitecture brings up this feeling of been in a beach. Well, despite it is not true, at least the beer is pretty good (more than 4 times elected as the best tap beer by Brahma/Ambev). Attended by interesting and beautiful people, the bar is also a great place for flirting, even though everyone in there came straight from the job. The range of snacks is pretty wide. The advice goes to the Picanha na Grelha (800gr of Argentinean Picanha on the Grill, dry garlic fried, mostard sauce, Vinagrete and manioc). It fits really well with tap beer and the sensation of being in the beach. When: Every day, from 11am till 1am.